New observations of a recently exploded star are confirming supercomputer model predictions made at Caltech that the deaths of stellar giants are lopsided affairs in which debris and the stars’ cores hurtle off in opposite directions. While observing the remnant of supernova (SN) 1987A, NASA’s Nuclear Spectroscopic Telescope Array, or NuSTAR, recently detected the unique energy signature of titanium-44, a radioactive version of titanium that is produced during the early stages of a particular type of star explosion, called a Type II, or core-collapse supernova. “Titanium-44 is unstable. When it decays and turns into calcium, it emits gamma rays at a specific energy, which NuSTAR can detect,” says Fiona Harrison, the Benjamin M. Rosen Professor of Physics at Caltech, and NuSTAR’s principal investigator. By analyzing direction-dependent frequency changes—or Doppler shifts—of energy from titanium-44, Harrison and her team discovered that most of the material is moving away from NuSTAR. The finding, detailed in the May 8 issue of the journal Science, is the best proof yet that the mechanism that triggers Type II supernovae is inherently lopsided. NuSTAR recently created detailed titanium-44 maps of another supernova remnant, called Cassiopeia A, and there too it found signs of an asymmetrical explosion, although the evidence in this case is not as definitive as with 1987A. Supernova 1987A was first detected in 1987, when light from the explosion of a blue supergiant star located 168,000 light-years away reached Earth. 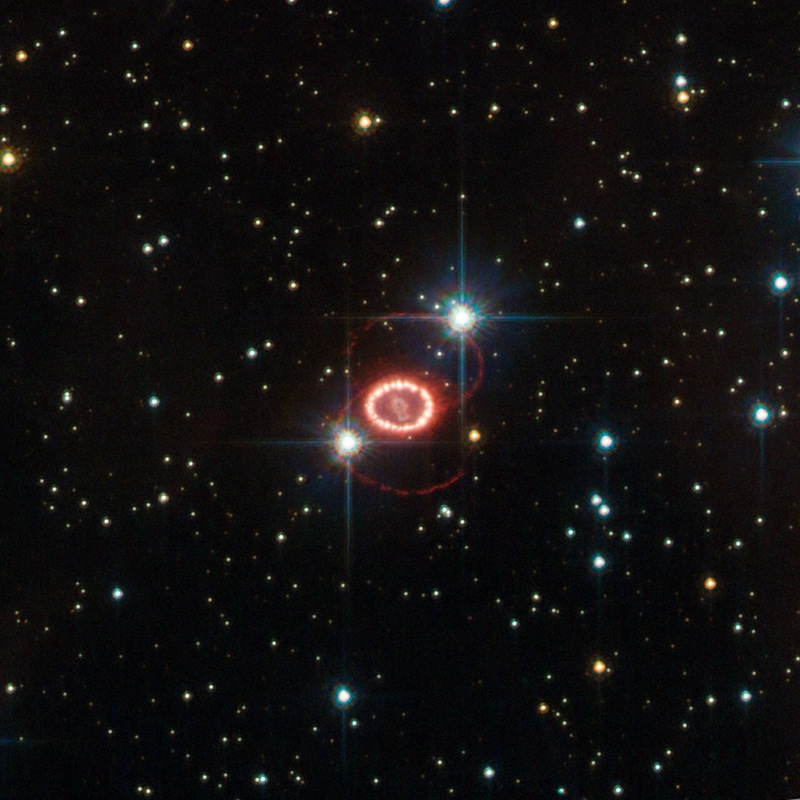 SN 1987A was an important event for astronomers. Not only was it the closest supernova to be detected in hundreds of years, it marked the first time that neutrinos had been detected from an astronomical source other than our sun. These nearly massless subatomic particles had been predicted to be produced in large quantities during Type II explosions, so their detection during 1987A supported some of the fundamental theories about the inner workings of supernovae. With the latest NuSTAR observations, 1987A is once again proving to be a useful natural laboratory for studying the mysteries of stellar death. For many years, supercomputer simulations performed at Caltech and elsewhere predicted that the cores of pending Type II supernovae change shape just before exploding, transforming from a perfectly symmetric sphere into a wobbly mass made up of turbulent plumes of extremely hot gas. In fact, models that assumed a perfectly spherical core just fizzled out. “If you make everything just spherical, the core doesn’t explode. It turns out you need asymmetries to make the star explode,” Harrison says. According to the simulations, the shape change is driven by turbulence generated by neutrinos that are absorbed within the core. “This turbulence helps push out a powerful shock wave and launch the explosion,” says Christian Ott, a professor of theoretical physics at Caltech who was not involved in the NuSTAR observations. Ott’s team uses supercomputers to run three-dimensional simulations of core-collapse supernovae. Each simulation generates hundreds of terabytes of results—for comparison, the entire print collection of the U.S. Library of Congress is equal to about 10 terabytes—but represents only a few tenths of a second during a supernova explosion. A better understanding of the asymmetrical nature of Type II supernovae, Ott says, could help solve one of the biggest mysteries surrounding stellar deaths: why some supernovae collapse into neutron stars and others into a black hole to form a space-time singularity. It could be that the high degree of asymmetry in some supernovae produces a dual effect: the star explodes in one direction, while the remainder of the star continues to collapse in all other directions. “In this way, an explosion could happen, but eventually leave behind a black hole and not a neutron star,” Ott says. The NuSTAR findings also increase the chances that Advanced LIGO — the upgraded version of the Laser Interferometer Gravitational-wave Observatory, which will begin to take data later this year — will be successful in detecting gravitational waves from supernovae. Gravitational waves are ripples that propagate through the fabric of space-time. According to theory, Type II supernovae should emit gravitational waves, but only if the explosions are asymmetrical. Harrison and Ott have plans to combine the observational and theoretical studies of supernova that until now have been occurring along parallel tracks at Caltech, using the NuSTAR observations to refine supercomputer simulations of supernova explosions. “The two of us are going to work together to try to get the models to more accurately predict what we’re seeing in 1987A and Cassiopeia A,” Harrison says. Additional Caltech coauthors of the paper, entitled “44Ti gamma-ray emission lines from SN1987A reveal an asymmetric explosion,” are Hiromasa Miyasaka, Brian Grefenstette, Kristin Madsen, Peter Mao, and Vikram Rana. The research was supported by funding from NASA, the French National Center for Space Studies (CNES), the Japan Society for the Promotion of Science, and the Technical University of Denmark. This article also references the paper “Magnetorotational Core-collapse Supernovae in Three Dimensions,” which appeared in the April 20, 2014, issue of Astrophysical Journal Letters.